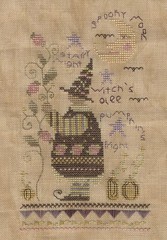 Little Witch is finished! I made a couple of changes. I didn't give her witch hair, and I didn't outline the dress in darker green on the bottom. I also borrowed an idea from Deb (artisticneedle) and put another flower on the top of the vine instead of the button. I just didn't like that button. Anyway, I'm so glad it's done and just in time for Halloween. I loved working on this design. Now I'll probably get back to Pear Tree Inn. I want to try to get some of these WIPs finished up! Your SB witch is awesome. I love this design, as I do most of theirs. Have you done any of the SB stockings yet? Those are so much fun. I am thinking of making one for my mom this year. Ann. Happy Halloween! Your SB finish is so cute and I love the fabric you picked. Congrats on the finish...just in time! It is adorable! What a great finish on your witch! The Halloween video of the boys is so cute!